Kim said, “If you were to take 6 images to represent your day, to place in a time capsule to look at again in years to come, what would you shoot?” I decided to use six of the photos I took on our visit to the Olympic Village in London last May. We were then encouraged to do a storyboard of those shots. So this is what I came up with, thank you Kim for sharing the storyboard templates, they are great and this brings back such great memories. We travelled on the train up to London, not a regular occurrence for my kids. The Olympic stadium itself and all the colourful tiles, my kids had a great time playing here during our walk about the village. 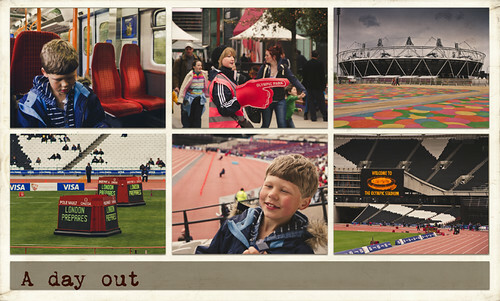 Inside the stadium, London Prepares for 2012. Enjoying watching the athletics, cheering on the competitors, despite the bitterly cold weather. It definitely did not feel like a day in May! The home straight on the track to London 2012. What would your six images be if you did a time capsule of your day?